Endoscopic transnasal surgery is rapidly replacing more radical external 'open' procedures. At Groote Schuur Hospital, Cape Town, we performed 94 advanced endoscopic sinonasal and anterior skull base procedures over a 2-year period. Most of these would previously have been performed using large external incisions requiring more invasive surgery with significantly higher morbidity. Endoscopic surgery is more cost-effective than open procedures because it reduces duration of hospitalisation, operating time and theatre consumables and obviates the need for postoperative intensive care unit admission. We have had no complications other than 2 cerebrospinal fluid leaks, but the potential risks of endoscopic sinonasal and skull base surgery are significant and proper training is required. Endoscopic surgery has revolutionised surgical practice in many surgical disciplines. Urologists were the first to develop endoscopes in the early 20th century, gynaecologists following in the 1960s and the 'laparoscopic revolution' occurring in the 1990s.1 A systematic endoscopic approach to the lateral nasal wall was first introduced by Messerklinger in the 1950s,2 but the true potential of nasal endoscopy has only been appreciated in the last 15 years. Radical surgery is being replaced by the concept of maximal surgery by minimally invasive techniques. This 'new' kind of surgery continually challenges surgical boundaries and requires interdisciplinary teamwork between specialties. Over a period of 2 years we have performed over 94 advanced endoscopic sinonasal and anterior skull base surgical procedures. Since 2005, all pituitary tumours at Groote Schuur Hospital have been approached via a minimally invasive transnasal transsphenoidal endoscopic approach and 60 endoscopic pituitary procedures have been performed. This approach involves teamwork with equal involvement by otolaryngologist and neurosurgeon. The complication rate was no more frequent than with non-endoscopic approaches. We have had 2 cerebrospinal fluid (CSF) leaks with pituitary surgery, 1 intraoperatively and 1 in the immediate postoperative period; both were successfully repaired endoscopically. The endoscopic approach to the pituitary fossa is much less invasive than the sublabial, transseptal and transpalatal approaches.3 No postoperative suturing, packing or nasal care was required. 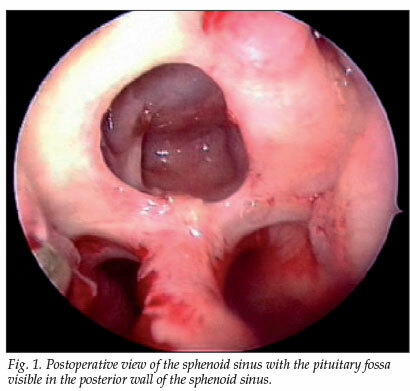 Since only the sphenoid sinuses are opened, the nasal cavity literally looked 'untouched' a few days after surgery (Fig. 1). Patients were discharged within a few days with only minor analgesics since they experienced minimal discomfort owing to the absence of surgical incisions in the nasal septum, palate or gingivobuccal sulcus. We also successfully resected 3 sinonasal melanomas, 3 ossifying fibromas, 9 inverting papillomas, 1 angiofibroma, 1 angioma, 1 meningocele, 1 intranasal dermoid cyst and 1 orbital apex cyst, and repaired 8 CSF leaks (Table I). Endoscopic surgery has largely replaced the external fronto-ethmoidectomy procedure for recurrent nasal polyposis, frontal and ethmoid sinus disease, mucoceles and fungal sinusitis. 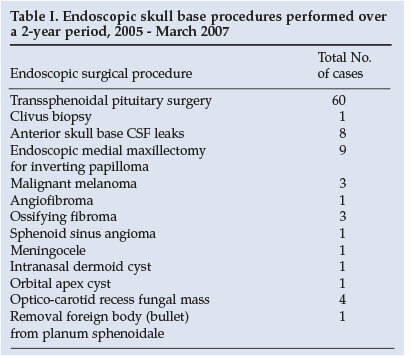 Endoscopic sinonasal and skull base surgery has definite advantages over microscope-assisted or external procedures. The team approach between surgeons allows up to four instruments to be used through the two nostrils. Endoscopes provide superior visualisation of areas that are not readily seen via the direct line of vision provided by the microscope. The endoscope is held and manipulated by one surgeon, while the other uses both hands to operate. The microscope focuses on one area while the endoscope permits continuous movement and visualisation of important structures such as the internal carotid artery and optic nerve. Although it was mastered by general surgeons many years ago, few ENT or neurosurgeons use this four-handed approach. In South Africa, pituitary surgery is often still performed via transseptal, transpalatal, sublabial or craniotomy approaches, requiring the use of an operating microscope. Disadvantages of the microscope are that vital structures adjacent to the operation field cannot be visualised, the surgeon tends to work down a narrow tunnel with difficult manipulation of instruments, and manipulation of the microscope is cumbersome. Traditionally the standard treatment for benign, intermediate and some malignant sinonasal tumours has been a lateral rhinotomy and medial maxillectomy (Fig. 2). The surgical incision generally heals well but may cause cosmetically unacceptable scars. Many of these benign and intermediate tumours can now be completely resected endoscopically.5,6 While the same principles of complete resection and clear margins apply to endoscopic surgery, not all tumours can be resected en bloc and some are removed piecemeal. Ligating the terminal branch of the internal maxillary artery, the sphenopalatine artery, can minimise blood loss during endoscopic surgery. No nasal packing is generally required postoperatively and the patient is discharged the day after surgery. Image-guided surgery (IGS) is used for difficult revision procedures and/or when surgical landmarks are absent. IGS provides a real-time correlation between actual surgery and a preoperative computed tomography (CT) or MRI scan, so the surgeon can follow the anatomical dissection of the sinuses and cranial base on a computer monitor in the operating room in real time. IGS can demonstrate the location of any instrument in the surgical field and shows the position of an instrument on the CT or MRI scan with optical infrared cameras that calibrate the patient's anatomical points to those of the preoperative CT scan (Fig. 3). We have found IGS very useful for navigating around the skull base. It makes the surgery safer and permits more radical surgery to be performed, and it is also an exceptional training tool in terms of pointing out surgical landmarks and verifying them radiologically. 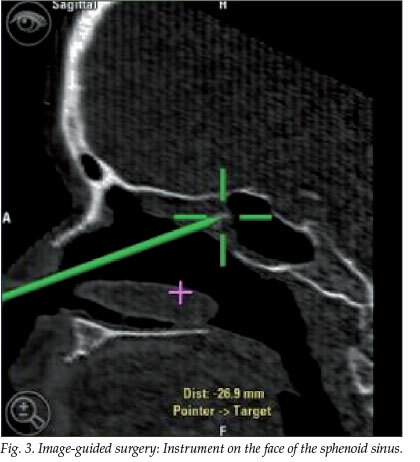 Endoscopic surgery for benign disease such as nasal polyposis, fungal sinusitis, mucoceles, inverting papilloma and CSF leak repair permits superior visualisation compared with external procedures. For surgeons still using open procedures, the endoscope can be a useful additional tool that will allow additional visual detail through the external incision. 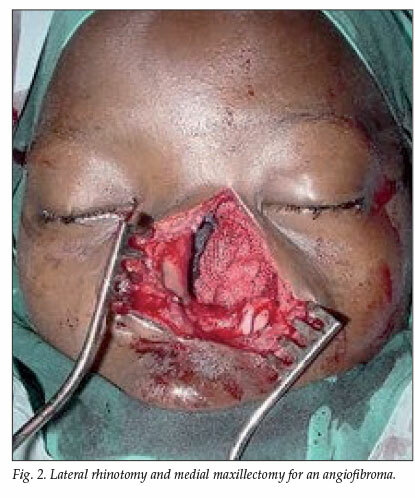 Nasal packing for epistaxis can be very painful and uncomfortable. We now perform endoscopic ligation of the sphenopalatine artery on patients with severe or intractable epistaxis. Patients are generally discharged the day after surgery, obviating lengthy hospital admission. Other endoscopic procedures replacing the more conventional open procedures include endoscopic dacryocystorhinostomy (DCR) for epiphora (watery eye due to nasolacrimal duct obstruction), orbital decompression for Graves' orbitopathy, optic nerve decompression, drainage of fronto-ethmoidal mucoceles and external fronto-ethmoidectomies for persistent frontal sinus disease. Endoscopes can also be used in combination with external procedures to perform minimally invasive surgery. We have used the endoscope through a small brow incision to access the frontal sinus for repair of frontal sinus CSF leaks, to obliterate the frontal sinus, to repair anterior table defects and to access an orbital apex cyst.